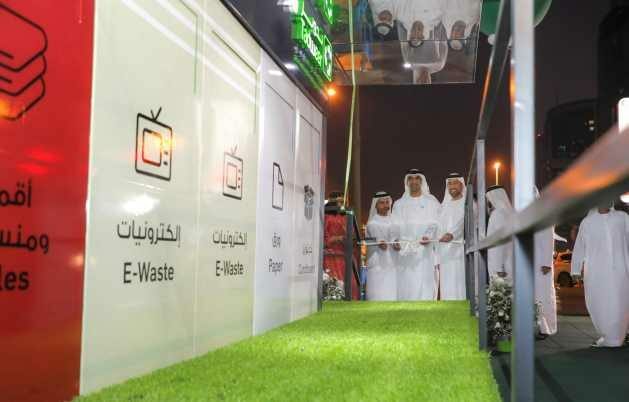 ABU DHABI, Jul 4 2018 - In a bid to promote community participation in segregating waste at source, Tadweer (The Centre of Waste Management – Abu Dhabi) has opened its first civic amenity for recyclable waste next to Khalidiyah Park in Abu Dhabi. The opening ceremony was attended by Dr. Thani bin Ahmed Al-Zeyoudi, Minister of Climate Change and Environment, Saif Badr Al Qubaisi, General Manager of Abu Dhabi Municipality City, Falah Al Ahbabi, Chairman of Department of Urban Planning and Municipalities, and Chairman of Tadweer, and Dr. Salem Al Kaabi, Acting General Manager of Tadweer, along with several senior government officials. Following the opening ceremony, Dr. Thani Al-Zeyoudi and Falah Al Ahbabi toured the facility and were briefed on the scheme’s operation and its role in reducing the cost and time required for recycling, while enabling the centre to acquire important data on the types and quantity of waste generated. This will allow Tadweer to make well-informed decisions on waste management in line with the requirements of different areas.